Global demand for paint and coatings is forecast to rise 3.7 percent per year to 54.7 million metric tons in 2020, valued at $193 billion. Advances will be driven by strong economic growth in developing regions, particularly in the massive Asia/Pacific market, where robust gains in building construction activity will boost sales of architectural paint. Suppliers to developing regions are also expected to benefit from bright outlooks for manufacturing output and infrastructure spending, which will spur sales of industrial coatings used in the production and upkeep of motor vehicles, furniture, marine vessels, and roads and bridges. 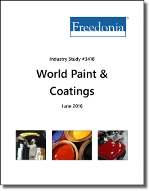 However, overall gains will be limited by the increased use of higher quality coatings and more efficient application processes in both the developed and developing world, reducing the volumes necessary to complete a given paint job. A significant slowdown in China’s economic output and construction spending will also hinder stronger overall growth. Companies mentioned include PPG Industries, Akzo Nobel, Sherwin-Williams, Valspar, Axalta Coating Systems, Nippon Paint, BASF, RPM International, and Kansai Paint.